Drivers can come in all different shapes, lofts, and weights, so before you start to try and improve your driving you need to know exactly what it does for you. 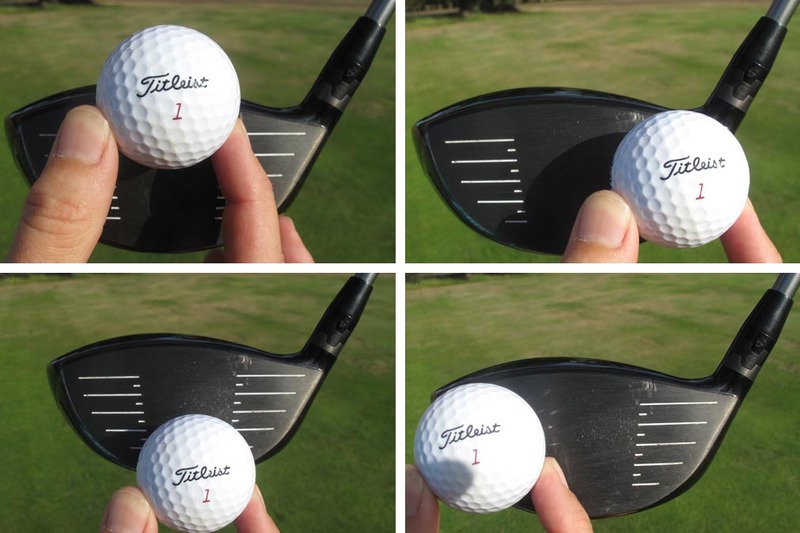 In the top photograph, you can see four positions a golfer doesn't want to connect with the ball: the top of the club, the bottom of the club, the toe, and the heel. Some drivers these days may hit the ball straight if you connect with it off the heel or toe but inevitably it won't go as far. Equally if you hit it off the bottom of the clubface it may have a good ball flight but not hitting it off the centre of the club will also mean less distance on the shot. When you're at the range, try to work out what a poor connection sounds like and maybe get a friend for a second opinion. You also need to know if you're hitting down on the ball and therefore need a more lofted clubface or hitting up on the ball which would require a less lofted clubface. So either adapt your game, such as hitting up on the ball, or find a driver that suits your swing if you don't want to change it drastically.